Polymer Coatings is a practical resource that offers an overview of the fundamentals to the synthesis, characterization, deposition methods, and recent developments of polymer coatings. 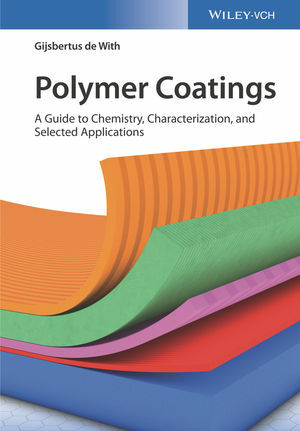 The text includes information about the different polymers and polymer networks in use, resins for solvent- and water-based coatings, and a variety of additives. It presents deposition methods that encompass frequently used mechanical and electrochemical approaches, in addition to the physical-chemical aspects of the coating process. The author covers the available characterization methods including spectroscopic, morphological, thermal and mechanical techniques. Written for chemists in industry, materials scientists, polymer chemists, and physical chemists, Polymer Coatings offers a text that contains the information needed to gain an understanding of the charaterization and applications of polymer coatings. Gijsbertus de With has been full professor in materials science at Eindhoven University of Technology (TU/e) since 1995. After graduating from Utrecht University and receiving his PhD in 1977 from Twente University, he joined Philips Research Laboratories, Eindhoven. In 1985 he was appointed part-time professor and in 1995 he became full professor at TU/e. His research interests include structure and interfacial phenomena related to the chemical and thermomechanical behavior of multi-phase materials. He has (co)-authored more than 350 research papers and holds about 15 patents. Throughout he has cooperated with other researchers, both from academia and industry and co-organized the Coatings Science International conferences from 2004 to 2014. In 2006 his two-volume monograph Structure, Deformation, and Integrity of Materials was published, followed by Liquid-state Physical Chemistry in 2013.